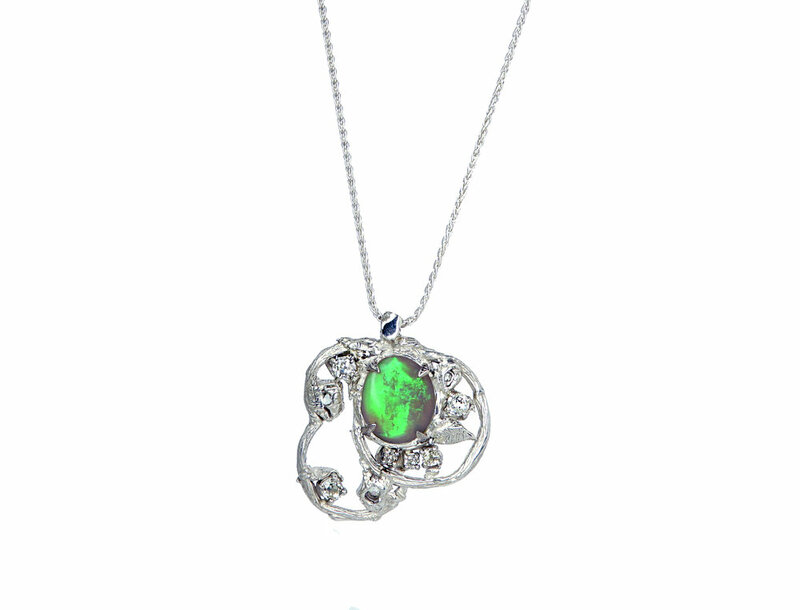 We believe that a piece of jewellery is a powerful and intimate object. Sometimes it is hard to find exactly what you want on the market. It can be that you are looking for a piece for a special event or simply that you have something in mind that you haven’t seen yet. Bespoke is a chance for us to work closely with our customers to make their dream become a tangible piece of jewellery. You can have a stone that you want set in a special piece or be looking for an unusual wedding band. Don’t hesitate to tell us about your dream piece. Initial meeting: this is an informal first meeting that can take place in person if you are in London or over email or phone call if you are not. We will discuss what is your project, if you have any wish for material and also what your budget is. We will start refining the idea together. You will then be sent three different designs to choose from. They will all be within the budget and respond to your brief. We can then meet again or have a chat by email or phone. At this point it is possible to make any changes you like to the design. You will then receive a final design for you to approve. This could be a paint up or another kind of artwork that we find appropriate for the project. It will show the piece in details. Once you are completely happy with the piece, you will be sent an invoice by email. We ask you to pay a deposit (fifty percents of the total amount) at that point so we can start making your piece. If you ordered a ring and you are in London, we will meet again for a fitting. We want to make sure that the piece is perfect for you before the final stages (like enamelling or setting a stone). Tadaa your piece has come to life! We will ask you to pay the remaining of the price and deliver your jewellery to you, either in person or by your preferred shipping option. Let’s talk about your dream piece! 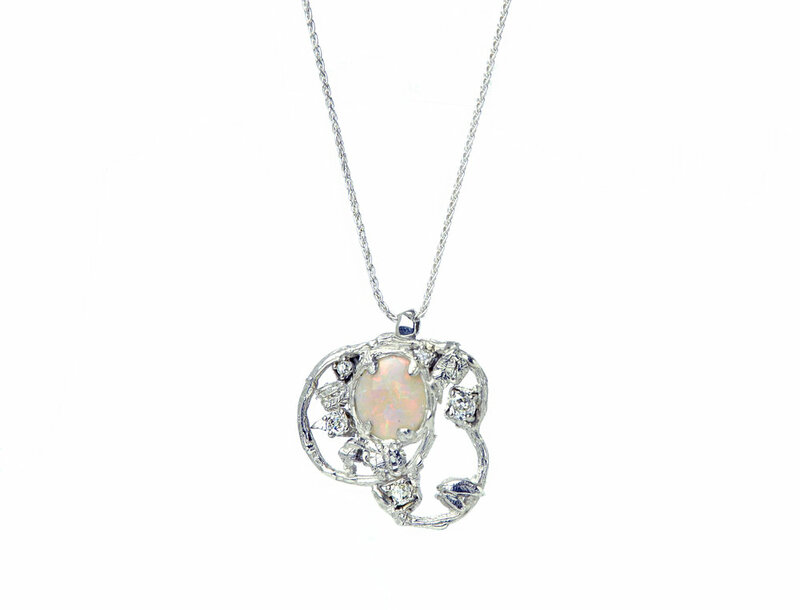 Top: double sided opal and rosecut diamonds in a 9ct white gold pendant. 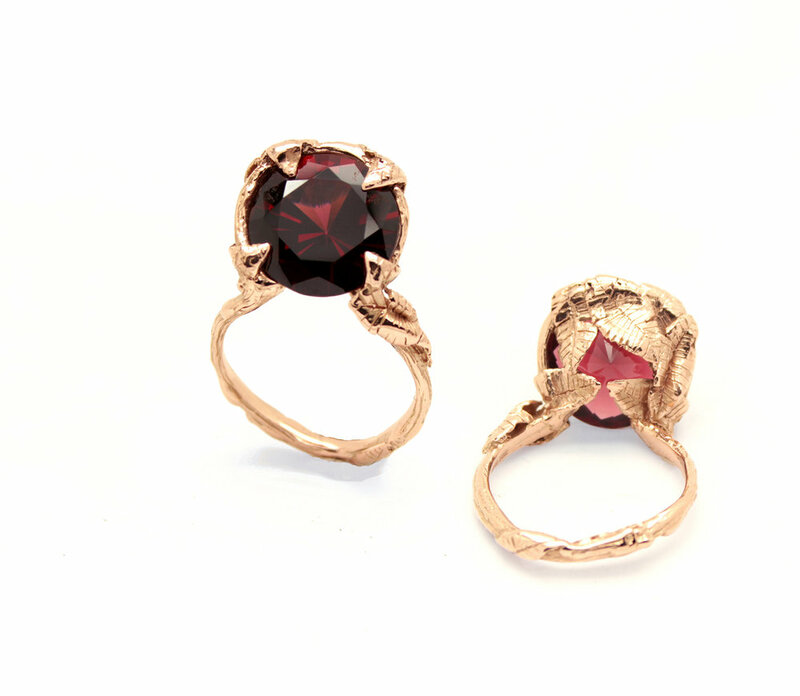 Bottom: Garnett in a 9ct rose gold ring.